Batman is a precious character to many, a superhero who is more normal and relatable than super and fantastical. A guy with nothing more than a few billion dollars, some (mostly) realistic tech, and a master of ninjitsu, Batman is the hero that we like to think we could actually be. But if we were Batman, what choices would we make, what type of hero would we be? Batman: The Telltale Series gives us the opportunity to find out by forging our own narrative, making our own decisions as the famous Dark Knight. Spread across five episodes, Telltale’s Batman offers a short and sweet foray into the world of both Batman and Bruce Wayne, uncovering mysteries about his past, forging friendships or establishing enemies, all while facing off against iconic villains from the comics. However, all in not well in Gotham, as for all Batman gets right narratively, it is offset by mindless gameplay and a host of technical issues. As an animated feature Batman: The Telltale Series is fantastic, as a video game it’s downright painful. Batman: The Telltale Series focuses on an already active Batman, thankfully choosing not to reiterate the character’s exhausted backstory. The story centers around three villainous characters; Two-Face, Penguin, and the leader of the Children of Arkham – I say villainous because neither Harvey or Oswald start out as adversaries, and part of the joy of Telltale’s story is the idea that you can prevent these characters from turning evil by making the correct decisions. The relationship between Bruce and Harvey is particularly emphasised throughout the game, with a charismatic and somewhat chipper Harvey campaigning to be mayor with Bruce’s support, and it’s great to see their friendship grow — if you should choose to — despite the impending doom that comic book history suggests will eventually occur. My favourite element of Telltale’s Batman is how little it feels like a Batman story, exploring the unexploited potential of the character of Bruce Wayne as opposed to attempting to find fresh nuance in the arguably over-exploited character of Batman. Despite what the title suggests, this is as much Bruce Wayne’s story as it is Batman’s, with players spending more time as Bruce; exploring his relationships with characters such as Alfred and Harvey, deciding how he’ll act in both public and private circles, if he’ll pursue romantic interests, and deciding which of the many characters that circle Bruce Wayne that he’ll either help out or abandon, which characters he will stay loyal to and which ones he’ll betray. Players can even choose whether to extract information from certain characters by sweet talking them as Bruce Wayne, or threatening them as Batman. The story itself is strong enough to keep players compelled from moment-to-moment. While the first episode is a little pedestrian — dealing with the crime boss Falcone — the majority of the episodes revolve around some unsavory details about Bruce’s parents. Far from the guardian angels he remembers them as, it appears as if the Wayne’s were corrupt, with rumors that Bruce’s father was a member of a deadly trio of crime lords, and that everything stamped with a Wayne logo has been built off of the suffering of others. It’s a dangerous line than Telltale treads, risking belabouring an already clichéd point, but the payoff is worth it. Most villains Batman encounters blame the Wayne’s for past torments and injustices which helps build a sense of personal connection between Bruce and his adversaries. Add into the mix the tremendous work Telltale did to give almost every character a strong backstory and ensure that despite their actions their motivations are both just and relatable, not to mention the terrific voice acting, and the result is a pretty good mystery/tale. Sadly the final villain is more forgettable than those that come before, and despite providing some strong backstory in the final episode, lacks the levels of depth afforded to other characters. The result is a somewhat muted ending that falls well short of the highs seen in earlier episodes, and prevents Batman: The Telltale Series from being truly amazing. That being said, while there might have been better options for the final villain, I’m glad that Telltale didn’t go for the obvious choice of using the Joker. There’s a neat easter egg here and there that strongly suggests he will be the focus of the game’s second season, and it’s nice to see that Telltale is not rushing Batman into an encounter with his greatest adversary. My biggest complaint from a narrative standpoint is the false sense of choice the game gives you, ultimately funneling you to more or less a single path despite your best efforts to meander and deviate – a point I expand on in the spoiler section below. However, before moving onto/past the spoiler section, one other complaint I would like to raise is the lack of a chapter select. Often the decisions that ‘make a difference’ come towards (if not at) the end of each episode, and with only an episode selection included in the game, in order to see alternative outcomes you have to replay an unnecessary amount of the episode – most of which will play exactly the same regardless of what choices you make. Consequently, most players either won’t bother, or turn to YouTube. Throughout my first playthrough I tried my damnedest to save Harvey from his seemingly unavoidable fate of becoming the villain Two-Face, but when faced with the choice of either saving Harvey or saving Selina, I choose Selina. The result was a Harvey who suffered the familiar face damage, I had set one of Bruce’s closest friends into a tail spiral towards villainy. I was eager to return to that decision and see the alternative Harvey that the game offered, the one that didn’t become Two-Face. Unfortunately, I was dismayed to discover that choosing to save Harvey has no effect on the character’s overall arc, he makes the exact same decisions to hurt innocent people and turn against Bruce to the point of invading his home. Not only is the lack of difference hugely disappointing, but Harvey’s understandable decent into evil as Two-Face is completely unsubstantiated when Batman saves Harvey from Penguin, his character undergoes a polar transformation with little to no ryhme, reason, or explanation. Furthermore, the decision with Harvey is only one that has a false sense of consequence; when in Arkham Asylum it makes no difference if you choose to use the phone or stop the fight moments later Gordon arrives with release papers, when with Selina regardless of whether or not you choose to sleep with her Harvey bursts into the flat in rage, and regardless of whether or not you take your cowl off at the very end of the game, both Bruce and Alfred make it out with barely any injuries worth mentioning. The only choice that makes any kind of real difference to the experience is whether you choose to stop Harvey or Oswald at the end of Episode 4. Narratively speaking the choice has little relevance, by the end you will have confronted both Harvey and Oswald and both will end up in custody by the end of the game, but the gameplay encounters are completely different. Even so for a game that lures players in with the promise of significant and heavy choices the fact that the main story beats are completely unaffected by your choices make them seem pointless in the first place. Moving on from the narrative, another element of Telltale’s interpretation that I quickly fell in love with is the stand out art direction. With so many different takes on the various elements of Batman, from his costume/armour, the Batmobile, his tech, and even the symbol on his chest creating a look that is both unique and fitting with the character can be a tall order, yet Telltale pulled it off, achieving a distinct sense of style and my favourite look for the character this century. Furthermore, Batman and company fit so well into Telltale’s signature — not to mention superb — mix of cartoon and cel-shaded art, which itself pops off the screen particularly well in the world of Gotham. Sadly, we’ve now reached the point of the review where I have to talk about the game’s gameplay and where Batman: The Telltale Series falls apart in terms of being a quality product. If you’ve played any of Telltale’s previous games you are probably aware that the performance of their games is practically non-existant, and true to form, Batman runs like a ‘Week One’ The Biggest Loser contestant. During my time with the game I encountered a litany of problems, with frame rate dips, stutters, and lip synching issues occurring at five to fifteen minute intervals. Less frequently I encountered a number of missing audio cues – it’s very disconcerting when Batman lands a punch that doesn’t make any sound or crashing objects are whisper quite. 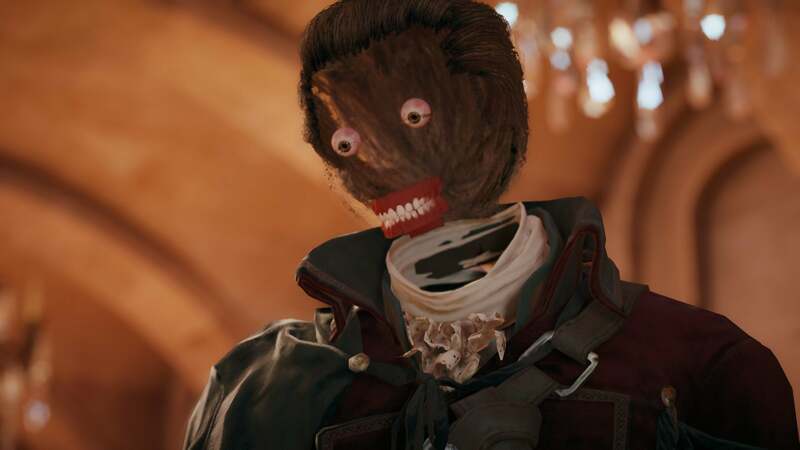 Additionally, there are animation problems; with some objects floating through the air, and one individual who suffered from the same mouth-and-eyes-only ailment that infamously plagued a number of characters in Assassin’s Creed Unity. Finally, to wrap it all up, I encountered occasional application crashes and on one instance a hard crash that required me to restart my PS4. Telltale’s Batman is the closest I’ve come to an unplayable game in quite some time. Batman is Telltale Games’ eighth release of its type and with over five years of experience since The Walking Dead Season One first released, that Telltale has continued to let such issues plague their games is, quite frankly, unacceptable! As for the gameplay itself, to be polite, I would say it is so-so, but the honest truth is that it is unnecessary and detracts from the overall experience. The main gameplay revolves around quick time events that take place during fight scenes. In and of themselves, these quick time events are fine – their hardly riveting, but they are functionally competent. However, these quick time events diminish the sense of awe that these fights scenes should have; firstly by creating an uneven, almost stop and start rhythm that results from slowing down Batman’s and his adversaries’ blows before they land — to give the player the necessary time to react to the on-screen prompts — and then returning to normal speed for the resulting dodges and hits. Secondly, the quick time events remove focus from the fight scenes themselves, focusing the player on the next button prompt to appear on screen instead. Consequently, most sense of spectacle that these scenes could have offered is lost. I would have much preferred to simply spectate these scenes as opposed to acting them, especially considering the animation and choreography work itself is top-notch, not to mention that any desire to experience the thrill that fighting in a video game as Batman has already been satiated by Rocksteady’s Arkham games. The one element of ‘gameplay’ that I did appreciate, were a criminally sparse handful of instances where Batman scans a room full of goons that he is about to hand out headaches to, and calculates the best method for dispatching of said goons. In gameplay terms this equates to drawing lines between enemies and nearby objects, allowing the player to decide if Batman will plant their face into a table, or swing off of light fixtures to deliver bone-breaking kicks, pick up a nearby chair as a makeshift baseball bat or use their head to break an expensive TV. Deciding how Batman would dispatch of his enemies, in what fashion and how brutally, was one of the highlights of the Batman sections of the game. Sadly these choices were limited to binary options, but they were fun choices to make nonetheless, and hopefully Telltale expands on these sections — both in number and variety — in Season Two. The other major gameplay elements revolve around solving mysteries as either Batman or Bruce, usually taking the form of examining crime scenes, and occasionally using the Bat-computer to solve basic puzzles. The former, examining crime scenes, revolve around walking around small spaces searching for nodes that Batman/Bruce can examine. Upon examining these nodes Batman/Bruce will offer a brief explanation of the examined clue normally concluding with a question along the lines of ‘I wonder how that got there?’, or ‘What could do this ?’. Upon examining all the clues the player must then connect pairs of clues together to begin building a picture of what occurred – a mind-numbingly simple task that can sometimes be as easy as matching a syringe to an injection wound, or a blood splatter to a blood-soaked object. Upon successfully matching all clues, further dialogue provides (Repeating dialogue that is already given when two clues are correctly paired) an almost full account of events as they happened, creating a disparity between the simplicity of the task the player is asked to perform and the complexity of the reconstruction. Solving puzzles with the Bat-computer is even more laughably easy and horribly mundane, with examples including moving a drone — glorified cursor — around quadrants of a map searching for phone signals, or rotating different shapes until they match together. While I appreciate that Telltale showcases the master detective side of Batman, the accompanying gameplay felt more like completing a five-years-olds activity book. Once again I would rather just watch Batman go to work, especially considering all of these puzzles are accompanied by in-depth narration anyways, removing any need for the player to piece the plot together. Telltale Games seem intent on justifying the latter part of their studio’s title regardless of whether or not the results enhance or diminish the experience, and diminish the experience they do. As an animated feature, Batman: The Telltale Series is fantastic; as a video game, it’s downright painful. As a narrative work Batman: The Telltale Series is amazing, consisting of compelling characters, interesting villains, and enough action and mystery to tie the whole thing together. While their take on the Caped Crusader and accompanying cast is not quite unique enough to stand out amongst the character’s many great depictions, the focus on Bruce Wayne over Batman, and the ability to partially help mould the story, result in an enjoyable and memorable tale. However, as a video game Batman: The Telltale Series is an inexcusable mess, plagued with a countless and extensive list of unacceptable performance issues that not only detract from the experience, but also persist throughout it, not to mention the so-so gameplay. While part of me can’t wait to see where the next exciting chapter in Telltale’s story takes Batman, the other part is dreading having to pick up the controller again.